Today HP filled out its cloud computing strategy, a broad-based set of products and services, that set a date (finally!) for its public cloud debut (May 10). See my separate earlier blog on all the news. 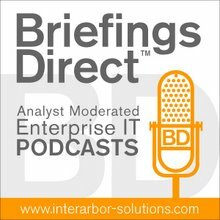 Disclosure: HP is a long-time sponsor of my BriefingsDirect podcasts. I've come to know HP very well in the past 20 years of covering them as a journalist, analyst and content producer. And that's why I'm an unabashed booster of HP now, desp ite its well-documented cascade of knocks and foibles. By waiting to tip its hand on how it will address the massive cloud opportunity, HP has clearly identified Cloud as a Business (CaaB) as the real, long-term opportunity. And HP appreciates that any way that it can propel CaaB forward for as many businesses, organizations and individuals as possible, then the more successful it will be, too. Opportune legacy. HP is not wed to a profits-sustaining operating system platform, integration middleware platform, database platform, business applications suite, hypervisor, productivity applications suite, development framework, or any other software infrastructure that limits its ability to rapidly pursue cloud models without being hurt badly or fatally financially. HP has been ecumenical in supporting all the major operating environments, Unix, Linux, Windows -- as well as all major open-source and commercial IT stacks, middleware, virtual machines and applications suites across development and deployment longer and more broadly than any one, any where. This includes product, technology, and services. Nothing prevents HP from doing the same as other innovators arrive -- or adjusting as incumbents leave. HP's robust support of OpenStack and KVM now continues this winning score. Cloud-value software. The legacy computing software products that HP is deeply entrenched with -- application development lifecycle, testing and quality assurance, performance management, systems management, portfolio management, business services management, universal configuration management databases, enterprise service bus, SOA registry, IT financial management suite (to name a few) -- are all cloud-enablement value-adds. And HP has a long software-as-a-service (SaaS) heritage in test and development and other applications delivery. These are not millstones on the path to full cloud business model adoption, they are core competencies. These are not millstones on the path to full cloud business model adoption, they are core competencies. The right hardware. HP has big honking Unix and high-performance computing platforms, yes, but it bet big and rightly on energy- and space-efficient blades and x86 architecture racks, rooms, pods and advanced containers. HP saw the future rightly in virtualization for servers, storage and networking, and its various lines of converged infrastructure hardware and storage acquisitions are very-much designed of, by, and for super-efficient, fit-for-purpose uses like cloud. Non-sacred cash cows. HP has a general dependency on revenue from PCs and printers, for sure. But, unlike other cash-cow dependencies from other large IT vendors, these are not incompatible with large, robust and ruthless cloud capitalization. PCs and printers may not be growing like they used to, but high growth in cloud businesses won't be of a zero-sum nature with traditional hardware clients either. As with item number 1 above, the interdependencies do not prohibit rapid cloud model pursuit. Security, still the top inhibitor to cloud adoption, is not a product but a process born of experience, knowledge, and implementation at many technology points. HP wisely built, bought and partnered to architect security and protection into its products and services broadly. As the role of public cloud provider as first line of defense and protection to all its users grows, HP is in excellent shape to combine security services across hybrid cloud implementations and cloud ecosystem customers. Data and unstructured information. Because HP supports many databases, commercial and open source, it can act as neutral partner in mixed environments. It's purchase of Autonomy gives it unique strength in making unstructured data as analyzed, controlled and managed as structured, relational data -- even combing the analytics value between and among them them. The business value of data is in using it at higher, combined abstractions across clouds, a role HP can do more in, but nothing should hold it back. It's already providing MySQL cloud data services. HP can foster the technology services and new kinds of integrator of services along a cloud business process continuum that please both enterprise costumers and vertical cloud providers. Technology services and professional services. HP, again the partner more than interloper, developed technology services that support IT, help desks, and solutions-level build support requirements, but also did not become a global systems integrator like IBM, where channel conflict and "coopetition" work against ecosystem-level synergies. It is these process synergies now -- a harmonic supply chain among partners for IT services delivery (not systems-level integration) -- that cloud providers need in order to grow. HP can foster the technology services and new kinds of integrator of services along a cloud business process continuum that please both enterprise costumers and vertical cloud providers. Management, automation, remote services. Those enterprises and small and medium businesses (SMBs) making the transition from virtualization and on-premises data centers to cloud and hybrid models want to keep their hands firmly on the knobs of their IT, but see less and less of the actual systems. Remote management, unified management, and business service management are keystones to hybrid computing, and HP is a world leader. Again, they are core competencies to advanced cloud use by both the enterprises and cloud providers. And HP's performance management insights, continuous improvement, on the cloud and business services that becomes the key differentiator. Neutrality, trust, penetration and localization. While HP is in bed with everyone in global IT ecosystems, they are not really married. The relationship with Microsoft is a perfect example. HP is large enough not to be bullied (we'll see how Oracle does with that), but not too aggressive such that HP makes enemies and loses the ability to deliver solutions to the end users because of conflict in the channel or ecosystem. Cloud of clouds services and CaaB values will depend on trust and neutrality, because the partner to the cloud providers is the partner to the users. Both need to feel right about the relationship. HP may be far ahead of all but a few companies in all but a few markets in this role. The breadth and depth of HP's global ambitions evident from today's news shows its intent on providing a full cloud kit continuum -- from code to countless hybrid cloud options. Most striking for me is HP's strategy of enabling cloud provisioning and benefits for any enterprise, large or small. There are as many on-ramps to cloud benefits realization as there are types of users, as there should be. Yet all the cloud providers need to be compete in their offerings, and they themselves will look to outsource that which is not core. As Ali Shadman, vice president and chief technologist in HP's Technology Consulting group, told me, HP's cloud provider customers need to deliver Apple "iCloud-like services," and they need help to get there fast. They need help knowing how to bill and invoice, to provide security, to find the right facilities. HP then is poised to become the trusted uncle with a host of cloud strengths for these myriad cloud providers worldwide as they grow and prosper. This is different from selling piecemeal the means to virtualized private-cloud implementations, or putting a different meter on hosted IT services. This is not one-size-fits-all cloud APIs, or Heathkits for cloud hackers. This is not cloud in a box. HP is approaching cloud adoption as a general business benefit, as a necessary step in the evolution of business as an on-demand architectural advancement. It knows that clouds themselves are made up of lots of services, and HP wants a big piece of that supply chain role -- as partner, not carnivor. HP then becomes the trusted uncle with a host of cloud strengths for these cloud providers as they grow and prosper. Shadman said that HP is producing the type of public cloud that appeals to serious and technical providers and enterprises, not hobbyists and -- dare I say it, Silicon Valley startups on a shoestring. This is business-to-business cloud services for established, global, regional and SMB enterprises. HP is showing that it can have a public cloud, but still be a partner with those building their own targeted public clouds. By viewing clouds as a supply chain of services, HP seeks to empower ecosystems at most every turn, recognizing that 1,000 points of cloud variability is the new norm. We should expect managed service providers, independent software vendors, legacy enterprise operators to all want a type of cloud that suits their needs, their heritage and best serves their end customers. They will be very careful who they align with, who they outsource their futures to. In other words, HP is becoming a booster of cloud models for any type of organization or business or government. Of course, HP is seeking to differentiate itself from Amazon, Google, Microsoft, IBM, Oracle, VMware, Citrix and Rackspace. It seems to be doing it through a maturity mode approach to cloud, not positioning itself as the only choice, or one size fits all. HP wants to grow the entire cloud pie. HP seems confident that if cloud adoption grows, it will grow well, too, perhaps even better. In other words, HP is becoming a booster of cloud models for any type of organization or business or government, helping them to not only build or acquire cloud capabilities, but seeding the business and productivity rationale for cloud as a strategy … indefinitely. This is very much like Google's original strategy over the past 10 years, that anything that propels the Web forward for as many businesses, organizations and individuals as possible, then the more successful Google will be with its search and advertising model. This has, and continues to, work well for Google. It places a higher abstraction on the mission, more than just sell more ads, but grow the whole pie. I believe we're early enough in the cloud game that the emphasis should be on safely enabling the entire cloud enterprise, of growing the pie for everyone. It's too soon to try and carve off a platform or application lock, and expect to charge a toll for the those caught in some sort of trap. Those days may actually be coming to an end.